Worldfocus contributing blogger Sana Saleem writes about the Pakistani reaction to the trial of Aafia Siddiqui, the Pakistani neuroscientist convicted of trying to kill American soldiers while in custody in Afghanistan. Of all the stories about alleged Al Qaeda members, perhaps none has been more peculiar than that of Aafia Siddiqui. Due to its peculiar nature, I would like to go back to where it all began. The US-educated Pakistani neuroscientist first appeared on the news radar in March 2003. According to her family, Aafia left her home on March 30 with her three children in a Metro-Cab to catch a flight to Rawalpindi. She then disappeared, and her family alleges that she was kidnapped by Pakistani agencies and subsequently handed over to American agencies. Despite the Siddiqui family’s accusations, the FBI continued to deny reports of Aafia’s abduction. Meanwhile, a story in Newsweek described Aafia as “reportedly arrested.” By this time, Aafia had been linked with Khalid Sheikh Muhammad, the alleged mastermind of the 9/11 attacks. Aafia’s family continued to demand attention to her disappearance, For instance, a letter from her uncle published in Dawn in March 2004 provides a chronology of Aafia’s disappearance. Another letter, published in May 2004, states that Aafia’s mother and sister have been put under house arrest and are not being allowed to contact anyone – the arrest was seen as retaliation for the previous letter. In May 2004, the Interior Minister confirmed speculations regarding Aafia by confirming that she was arrested from Karachi and handed over to the US authorities for allegedly being involved in terrorist activities. Meanwhile, more information was gathered about these alleged terrorist activities. Reports surfaced that Aafia and her husband purchased night-vision goggles and body armour from an online military store; that she opened a post office box for Majid Khan, a Pakistani who was held at Guantanamo on suspicion that he planned attacks on American gas stations; and, most importantly, that she traveled to Monrovia to buy diamonds which were then used to fund Al Qaeda operations. The authorities were unable to provide evidence for these allegations, which is why Aafia has not faced terror charges. For the next two years, Aafia’s case remained shrouded in mystery until her name appeared in Amnesty International’s list of disappeared suspects in the war on terror. More reports poured in suggesting she was detained in a secret U.S. prison. However, it wasn’t until August 2008 that Aafia’s case was brought to the forefront. A crackdown on the media by General Pervez Musharraf’s government caused journalists to take up Aafia’s case as part of a campaign exposing the general’s heinous crimes. During a press conference organized by the Pakistan Tehrik-i-Insaf, British journalist Yvonne Ridley claimed that an anonymous woman sometimes referred to as “Prisoner 650” being tortured at Bagram Airbase may have been Aafia. Ridley claimed that she was told that a female prisoner had been held for years and, after sexual abuse and confinement, had deteriorated physically and mentally. Ridley’s speculation that the woman could be Aafia stirred the issue in the media. That day marked the beginning of the campaign vowing to bring justice to Aafia. She was portrayed as ‘Pakistan’s daughter’ who had been sold to the U.S. for money. As the issue of the missing people of Pakistan reached a turning point, Aafia came to symbolise the atrocities linked to the U.S.-led the war on terror, and her case exposed the collaboration between Pakistani and U.S. authorities. 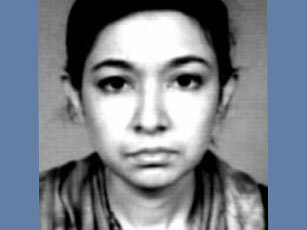 Aafia also attracted international attention as the first woman to be sought by the FBI in connection with its pursuit of al-Qaeda. Last week, she was found guilty on charges of the attempted murder of U.S. soldiers in Afghanistan. Aafia’s conviction has provoked many emotional responses that show little regard for the judicial process. “The jury couldn’t handle the truth because that would have meant that the defendant really had been kidnapped, abused, tortured and held in dark, secret prisons by the US before being shot and put on a rendition flight to New York,” remarked journalist Ridley when I asked her opinion on the verdict. Before us, it seems, are two competing narratives. But I would not rule out other alternatives. The actual details, of Siddiqui’s arrest — whether it occurred five years ago or two weeks ago — is unclear. The initial claims made against her years ago are cause for concern. But it is puzzling as to why, if they were true, there was no legal followup. Even now, those claims go unmentioned in the present legal action against her. Siddiqui is not being treated as an enemy combatant; rather, she’s being prosecuted in conventional U.S. courts, albeit in a more closed anti-terrorism context. And so Siddiqui’s arrest provides not answers, but more questions. Indeed, the majority in Pakistan echo the same sentiment of dismay and anger. Aafia’s case highlights the underlying mistrust amongst the Pakistani people for the United States, as many have openly criticised the judgement, and termed it biased. Some claim they never expected a different verdict because U.S. courts can’t be trusted to uphold the truth. Such statements are far more worrying then the verdict itself. The growing rift between the masses in Pakistan and U.S. authorities is distressful. If anything, Aafia’s case should turn the nation’s attention towards Pakistan’s ‘missing persons’ issue. Aafia’s trial has not been able to yield satisfactory answers about where she was, who picked her up and why, or even who she really is. If anything, her outbursts in court make her appear delusional, depressive and possibly psychotic. The only outcome of Aafia’s verdict has been a surge of even more questions. But her misery has given a face to hundreds of Pakistan’s disappeared victims awaiting justice. Now that Siddiqui is in a US prison she should have medical attention and legal rights. We shoul be able to learn more about her case. What happened to her children? A very good article above. All of America should read it. It appears that the U.S. and Pakistani governments may have quite a lot to cover up, as she may have been falsely imprisoned for years and tortured. She was in room with 11 men and she grabs a gun and starts shooting and hits no one? Nobody believes that story. Why would 11 men need to have any guns with only one woman in the room. Guards in prisons don’t carry guns when in contact with prisoners, for just that reason. Even police officers give up their guns before going into jails. This whole story stinks. With 11 people in a small room, how could she shoot and not hit anyone and not hit the wall? If 11 guys need guns to restrain one woman, we need to fire them and get better men. If she was innocent of EVERYTHING, why was she sentenced at all ? The fact that she was ‘sold’ is more of an indictment of pakistan NOT the US.AS for prisoner 650, she is on record stating that she would not get a fair trial in a jury composed of jews. What sympathy can one garner for this bigot ?